There are so many good fathers who love their children. I wish the media and stop perpetuating lies that men; especially black men, do not love their children. They do. Carrying a child in mother’s uterus doesn’t automatically mean that the mom has more love than the dad. Love is universal, as humans we were created with the ability to love and be loved. Unfortunately, the media often highlights negative situations because negative news seems to encourage higher ratings. Recently, the negative news has begun to weigh heavily on me because of its inaccuracies. How are father’s suppose to feel encouraged when everywhere they turn people are looking for them to mess up and perform poorly? I remember working my first job in college and one of my co-workers said to me, “Stereotypes, aren’t bad because they are based on the truth.” Sadly, he isn’t alone with ideology. Unfortunately, our society would agree that stereotypes are true. However, stereotypes should be dismissed because they rob us of being able to recognize the truth. Stereotypes cause us to hone in on problems and look for the negative first to reinforce what we may have heard from others. 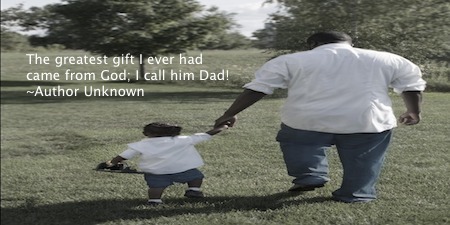 This poem by Prentice Powell called “Good Father” rings true. Many father’s do love their children. When my husband goes out with our girls people watch his actions and his words like a hawk. Many compliment him and look at him like he just arrived from another planet. My husband doesn’t have any reactions to it, but I do. I love my husband and I love that he is a great father, but those are not unique characteristics that he has. He is not one in a million when it comes to being a good father. There are many. America, we (people of different nationalities) are capable of love, affection, care, intelligence, hard work, compassion, integrity, dignity, etc. These are not rare hard to find character straights among black men. In fact, I know many wonderful fathers, wonderful husbands, spiritual, intelligent and hard-working loving black men and boys. Don’t feed into the stereotypes that you see on TV the negative images you see are not universal. I challenge each of you to look at black fathers and think something positive first. When you look at them try to see the best in them, not judgement. Their measuring stick should be against the stereotypes on TV of people. Measure them against themselves, if you don’t know them don’t automatically assume the worse or the best, just try to see them in love as God see them.